I saw this excerpt in The Week recently. It is a great illustration of what can be done with forethought and careful management. I would love and plan to visit when the opportunity arises. Buy the book – I have: Adapted from Wilding: The Return of Nature to a British Farm by Isabella Tree © Isabella Tree. With breathtaking speed, thickets of 3ft-high thistles were advancing over the ground, engulfing acre after acre. It was like The Day of the Triffids. Every day, as my husband, Charlie, and I walked over what had once been arable fields on our family farm, we could barely believe what we were seeing. As any gardener knows, the “cursed thistle” is almost impossible to dig out. In our case, however, using weedkiller was out of the question. Several years into a pioneering project to rewild the land, we were no longer willing to use the pesticides, fungicides and artificial fertilisers that had once seemed so essential. Giving up intensive farming on our 3,500 acres had been a difficult, but unavoidable, decision; on desperately poor soil – heavy clay – we rarely made a profit and had worked up an eye-watering overdraft. Inspired by a rewilding experiment in the Netherlands, we’d sold our dairy herds and farm machinery, stepped back, and allowed nature to take the driving seat – the first project of its kind in Britain. This didn’t go down well with many of our neighbours, who complained that it was an immoral waste of land, an eyesore full of weeds and brambles. And now the great thistle invasion seemed to be proving them right. Had we been hopelessly naive? Was this the end of our vision to establish a patch of self-wilded nature, a messy, rambunctious, mini-wilderness in the heart of West Sussex? Just when all seemed lost, out of a clear blue sky came a very different invasion. That warm Sunday morning in May 2009, we woke to see painted lady butterflies streaming past our bedroom window at the rate of one a minute. Outside, thousands upon thousands of them had descended on the swathes of creeping thistle to lay their eggs. As we approached, our dogs ran into the prickly cover, sending up puffs of orange and brown wings like autumn leaves. A few weeks later, spiky black caterpillars were swarming over the thistles, spinning silken webs like tents. By autumn, the caterpillars had wolfed down the leaves, pupated and flown away, leaving our thistle fields in tatters. The next year, our 60 acres of thistle had vanished entirely. Not only had nature solved the thistle problem, but thanks to sitting on our hands, we’d been given a ringside seat at one of its greatest spectacles. Knepp Castle Estate is just 45 miles from central London, though you wouldn’t know it. Thorny scrub – hawthorn, blackthorn, dog rose and bramble – has punched through fields that, only a few years earlier, were blanketed with maize and barley. Miles of hedgerows, previously cut back every autumn – thereby depriving birds of winter berries – have exploded into the welcoming earth. The first thing that strikes visitors is the noise: the low-level surround-sound thrumming of insects. Then the countless different bird songs: the very air, it seems, is being recolonised with the sounds of the past. We walk knee-deep through ox-eye daisies, bird’s-foot trefoil, ragged robin, knapweed, red clover, lady’s bedstraw, crested dog’s tail and sweet vernal grass, kicking up grasshoppers, hoverflies and all sorts of bumblebees. On a good July day, I can count ten species of butterfly – we have 34 altogether, including the rare purple emperor – without moving from my desk. At night, Knepp hosts an incredible 441 different species of moth. Meanwhile, more and more endangered species turn up every year – such as turtle doves, which are on the brink of extinction, and nightingales, whose numbers fell by 91% between 1967 and 2007. Cuckoos, spotted flycatchers, fieldfares, hobbies, woodlarks, skylarks, lapwings, house sparrows, lesser spotted woodpeckers, yellowhammers, woodcock, red kites, sparrowhawks, peregrine falcons, all five types of British owl, the first ravens at Knepp in the past 100 years – the list goes on and on. The speed at which all these species have appeared has astonished observers, particularly as our land was, biologically speaking, in dire condition in 2001, at the start of the project. The key to Knepp’s extraordinary success? It’s about surrendering all preconceptions, and simply observing what happens. By contrast, conventional conservation tends to be about targets and control, and often involves micromanaging a habitat for the perceived benefit of several chosen species. Originally, Charlie and I had embarked on this project – funded chiefly by conservation grants – out of an amateurish love for wildlife. (We supplement our income by renting out redundant farm buildings, selling organic meat and organising wildlife safaris.) But the rewilding of Knepp has turned out to be far richer than we ever dreamed and is producing a wealth of information new to science, often subverting what ecologists think they know about the natural world. Leave a piece of land to nature for long enough, and it will eventually become a dense wood. Every farmer knows that. So what stopped the trees from taking over? Herbivores. Unfortunately, many of the big, grazing animals that once roamed Britain – such as the wild ox, the original wild horse and the truly wild boar – are now extinct. But we have modern equivalents and we decided to introduce some to Knepp: red and fallow deer, Exmoor ponies, Tamworth pigs and old English longhorns. We’d chosen the longhorns because they retain enough of their wild ancestor’s genes to survive all year round outside. But how would they really behave when they were allowed to run wild? In featureless fields, our old dairy herds had simply kept their heads down chewing the cud, but without fences to contain them, the longhorns could give full expression to their innate desires and preferences. They weaved among the trees, rubbing themselves against trunks and low-lying branches, raising their heads to strip off leaves and buds with their long, gluey tongues; they foraged in the margins of ponds and streams, waded through the marsh. They seemed to love the sallow trees: when the flies and midges were bothersome, they’d rub their horns against the branches, smearing sap onto their faces as insect repellent. At first, not intervening, particularly when the longhorns were calving, felt entirely alien. We’d find ourselves suddenly encountering newborns lying in a ditch or hedge. Shortly after the birth, the cow would often seek out a patch of nettles to eat, presumably to replenish her levels of iron. After suckling her newborn, the new mother returns to the herd, commuting sometimes miles to her fellows and back again until her calf is strong enough to follow her. The calf’s introduction to the herd is momentous. The cattle crowd around, lowing gently, sniffing at the new arrival one by one, imprinting its aroma. While the calves are still young, one or two experienced matrons often guard them in a nursery while the herd moves on to feed. But even after a cow has more offspring, the family bond remains strong. I thought back to the agonising nights, many years before, when I’d hear bellowing calves, newly separated from their mothers. At just three days old, they’d been put into calf units, where they were fed on powdered milk. It was also soon clear that the longhorns were creating opportunities for other species. In places where a low branch provided a scratching post, for example, the clay compacted by their hooves created saucers that periodically filled with water. These clean-water “ephemeral ponds” are an important habitat for plants like water crowfoot, water starwort and stoneworts, and a whole range of snails and water beetles, as well as the endangered and ethereal fairy shrimp. The first March after the longhorns’ arrival, their former owner paid us a visit, anxious to see how they’d weathered the winter without human intervention. He couldn’t believe we hadn’t fed them. Nor had there been any need for the vet; indeed, our calving and health statistics were better than on most conventional cattle farms. Apart from all that, longhorns produce exceptional beef. We started culling when our herd had expanded to 283 head – more than the land could happily sustain. Suddenly, a by-product of rewilding became a significant income stream. 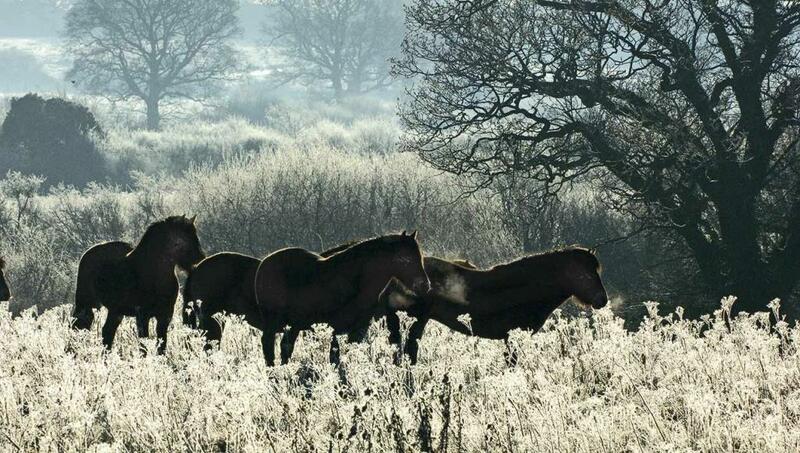 Six Exmoor ponies arrived months after the cattle, in 2003. As they galloped from the trailer, bucking their way back to freedom, we could see we were dealing with an animal way wilder than the longhorn. There’s little doubt that they are an ancient breed: fossil remains dating back to 50,000BC have been found round Exmoor. Now an endangered species, they’re rarer than tigers. A year later, we introduced two Tamworth sows and their eight piglets. 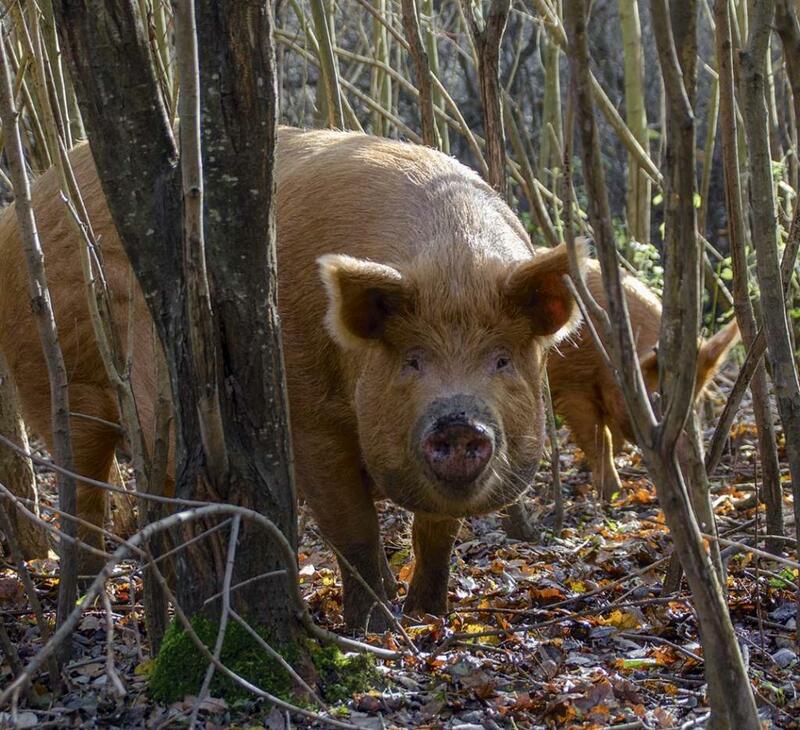 Prohibited by law from keeping wild boar, we’d opted for this old breed to stand in as their proxy – rootling and disturbing the soil as their ancestors had on our land in the time of King John. The Exmoors acted as if we’d introduced them to a pack of grizzly bears. One glimpse of the vast, bristly, ginger farmyard sows and the ponies were running for the hills. Perhaps they had some atavistic memory of wild boar predating on newborn foals. The pigs had an extraordinary impact. The instant they were let out, they destroyed Charlie’s manicured verges along the drives with the unstoppable momentum of forklift trucks. Then, two abreast, they unzipped the turf down the public footpaths. We realised they were zeroing in on slivers of the land never ploughed – margins rich in invertebrates and rhizomes. At first, we were dismayed to observe their capacity for damage. But the land’s ability to regenerate was equally astonishing. Within days, a patchwork of pioneer plants would appear where the sward had been opened. Invertebrates, including rare bees, colonised the exposed ground. In winter, wrens, dunnocks and robins trailed in the wake of the Tamworths, picking for insects in the furrows. Ants used clods of earth turned over by the pigs to kick-start anthills that have grown, in some places, over a foot in eight years. Anthills, in turn, attracted mistle thrushes and wheatears – and green woodpeckers, whose diet consists largely of ants. To many of our neighbours, the most offensive aspect of Knepp is the appearance of “injurious” weeds. By far the worst, in their view, is common ragwort, which is thought to be a killer of livestock. And it does, indeed, contain toxins that, when eaten in large quantities, cause liver failure and death. But grazing animals have lived with it for tens of thousands of years. Our longhorns, Exmoors and Tamworths, as well as roe and red deer, graze among ragwort with no adverse effects. They know to avoid it. Poisoning arises not in the wild, of course, but where fields and paddocks are over-grazed and the animals have no choice but to eat it. To put it in context, there are plenty of other common plants that can kill, including foxglove, cuckoo pint, ivy and yew – as well as daffodils, one of our most poisonous plants. As for ragwort, it’s one of the most sustaining hosts to insects that we have in Britain: in all, 177 species of insect use it as a source of nectar or pollen. In time, the nightingales arrived in such numbers that we began to have nightingale dinners, taking friends out at night to listen to their astonishing arias. Most had never heard one before. Conservationists began taking an interest when it emerged that the nightingales nested deep in the exploding skirts of an overgrown hedge, fringed with brambles, nettles and long grasses. Even more exciting even than the nightingales was the arrival of turtle doves, with their throaty turr-turr-ing. There are estimated to be fewer than 5,000 pairs left in the whole of Britain. The pigs may yet again be playing a role: their rootling produces exactly the right conditions for the germination of seed-bearing wildflowers that attract these rare birds. One thing is for certain. If we hadn’t allowed a dynamic ecosystem to establish itself here, we’d never have had turtle doves – or any other endangered species – in the first place. And if all these natural miracles can happen here, on our depleted patch of land in the overdeveloped, densely populated southeast, they can happen anywhere. This entry was posted in UK Wildlife and tagged Birds, Blog, Britain, Conservation, Environment, Nature, Threatened Birds, Threatened Species, Trees, UK Nature, Wildlife. Bookmark the permalink.